Have lost zip archive file password? And you can't able to open them so don't panic just download Stella Zip password recovery tool which is easy technology to recover zip archive password. Zip password unlocker software is remarkable to option to break zip password protection from zip archive compressive file. This Stella Zip archive password recovery software quickly unlock zip archive file password applying by using three sharp methods like:- brute force attack/dictionary attack and mask attack. This zip password unlocker program easily cracks any kind of combustion/alphabetical/alphanumeric and symbolic password of zip archive files and allows to open your zip file password without any problem. 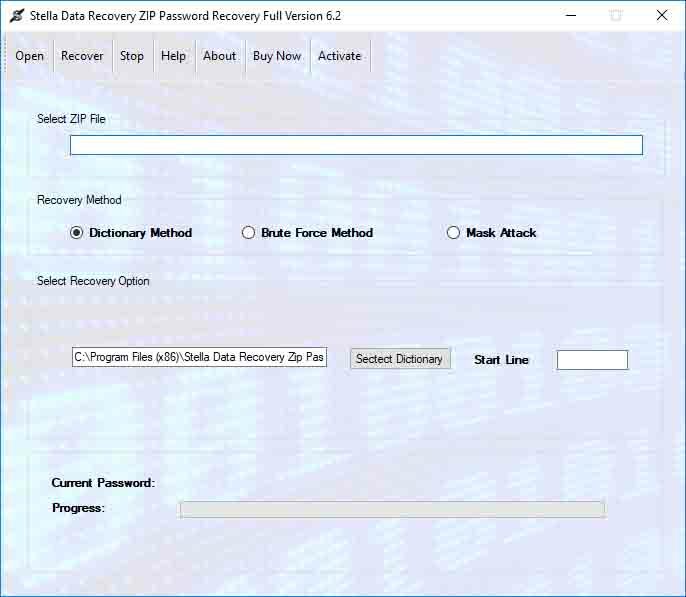 This zip archive password recovery program to easily install whole version on windows like as:- Win2000,Win7 x32,Win7 x64,Win98,WinServer,WinVista,WinVista x64,WinXP,win8,win8.1,win10. This application gives you demo version at free of cost with demo you can recover first 2 character zip file archive after that if you want to recover whole password then get full version of software at full license of Software.